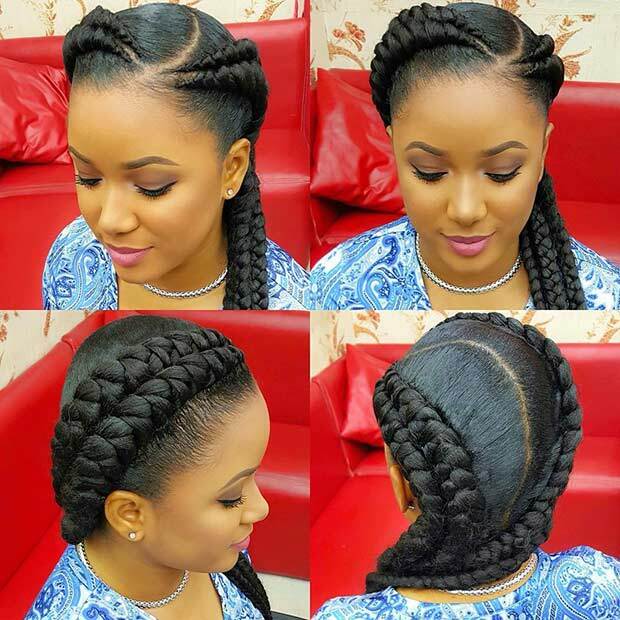 Braid hairstyles with weave are versatile and the styles that can be created are endless. There are so many braids out there to experiment with. To get you inspired, we have found 25 of the trendiest braid hairstyles of the year. Each one will make you stand out from the crowd and will step up your style game. The only problem you’ll have is deciding which one you want to try next! Opt for an elegant half up style, which includes a high, curly ponytail. The top is also braided and the stylist wrapped a few twists of the weave around the pony base to up the glam factor. Bun hairstyles are a must have for the spring and summer. 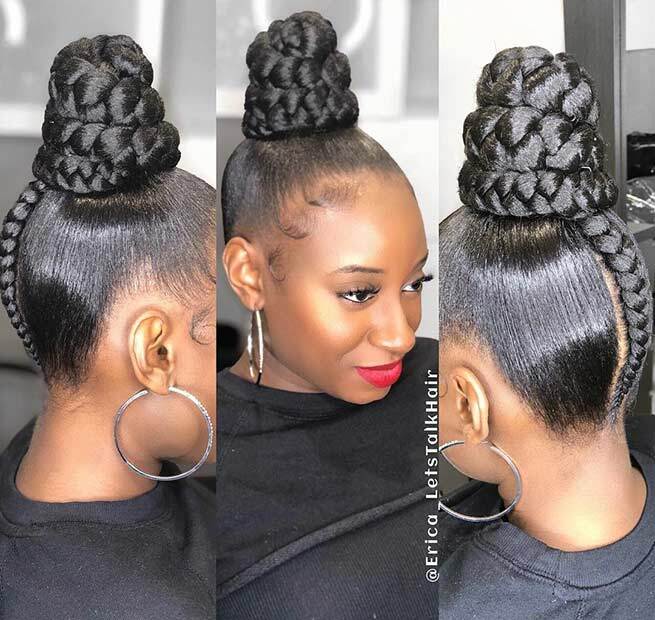 So why not combine two of the trendiest looks to create a braided bun? 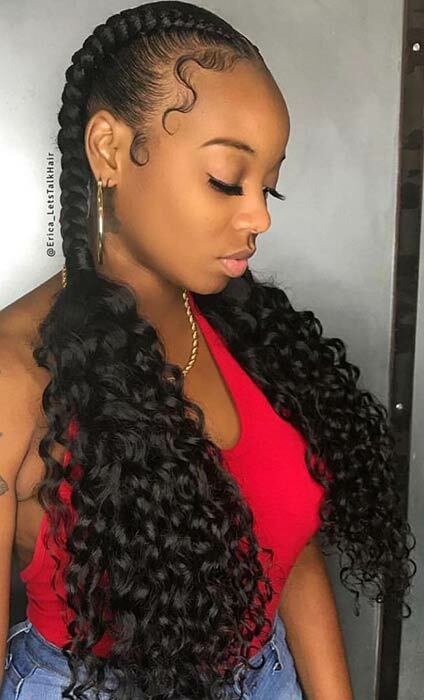 The smaller and thicker braids in this style are gorgeous. You could give this a go or try different thicknesses as this can be done in so many ways. It’s winter time! 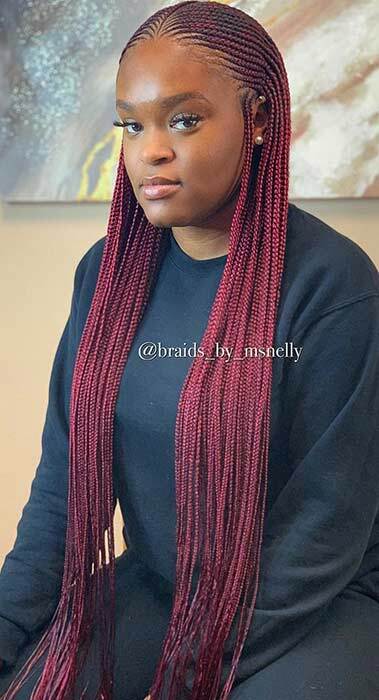 So, why not give your braids a little lift with some color. Deep burgundy tones like this one would be a great choice. Burgundy braids can be worn during spring and summer, too. 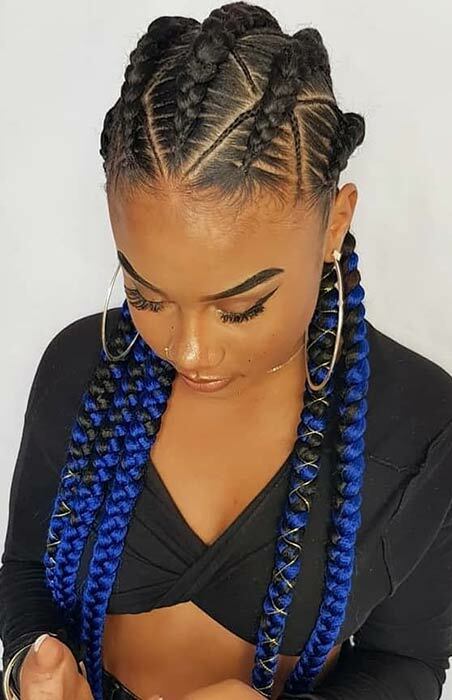 If braids with color aren’t your thing, try a different color. Any color would work for a style like this. Our next style shows a sleek cornrow ponytail. 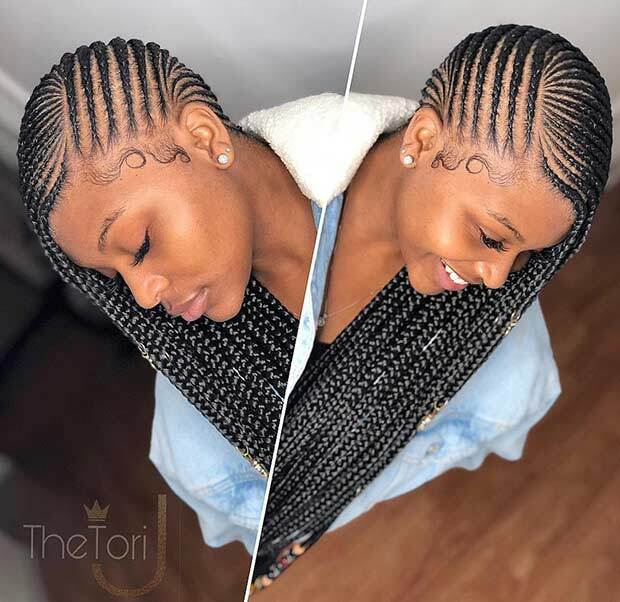 Cornrow braids are very trendy and you can see why. These are feed in cornrows that start very small and gradually get bigger. This creates a unique style and gives the ponytail a fresh, new look that is great for spring and summer. Don’t forget that you can adorn the braids with some hair cuffs, cords or both. For more braided ponytail ideas, click here. Braided hairstyles are a work of art and our next pick proves that. If you opt for this look, jazz up the braids with some hair accessories. Braid cuffs are a stylish finishing touch that you can easily add to your hair. 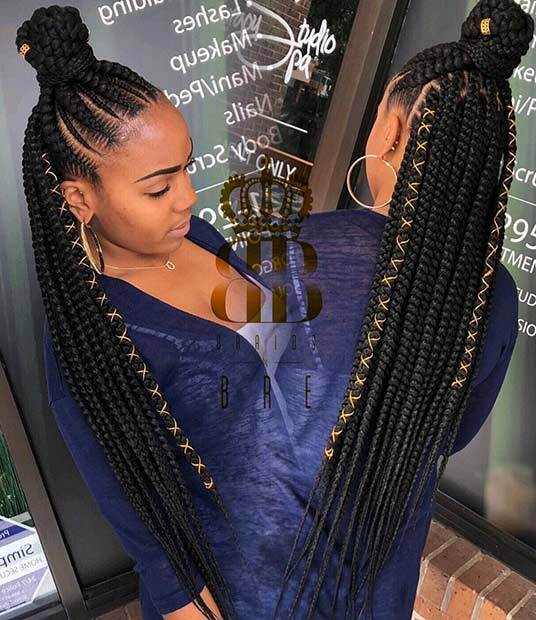 These long braids look stunning with the gold cuffs. You could add as many as you like and opt for any color. Half up and half down hairstyles have always been popular. It is a gorgeous style that will update your look for spring and summer. 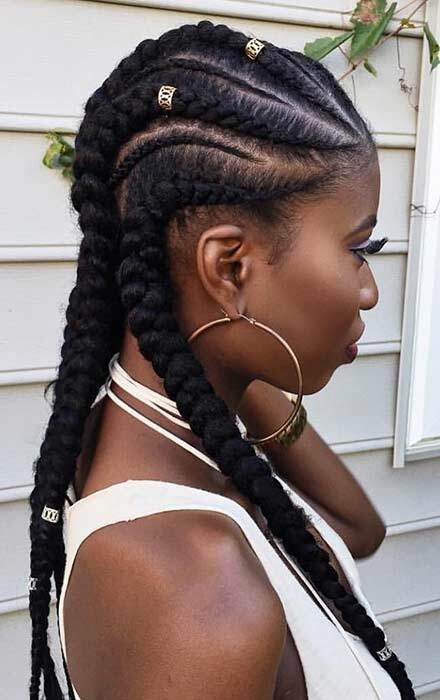 The thing we love the most about this style is that you can just leave the braids hanging and look totally breathtaking. That’s probably because of the length, they are super long! In search for a breath-taking wedding updo? Something like this would wow everyone and would make you remembered for all the right reasons. So, if you have a wedding coming up, consider a beauty of a style like this one. Make sure to include a pretty hair accessory, just like featured. 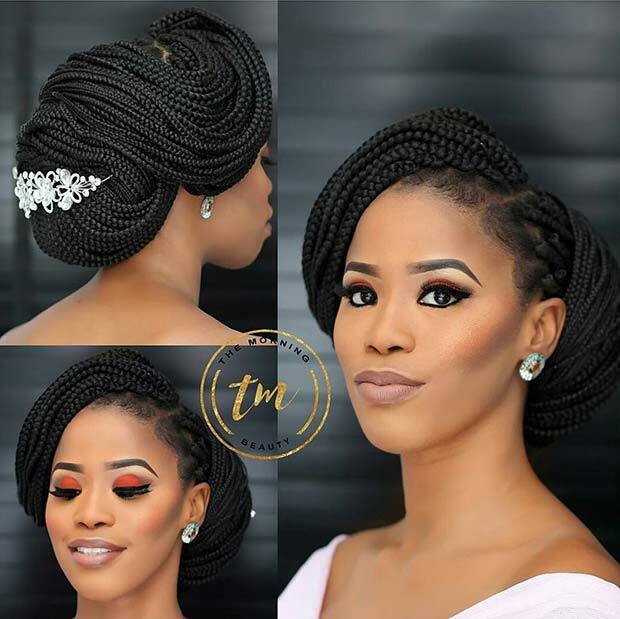 Here is another way to wear stunning cornrows in style. 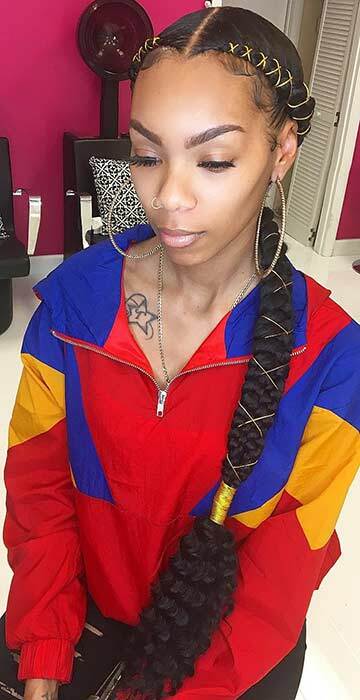 This look features thicker cornrows that run down the head. Instead of going into a ponytail, these are just let free. It is a trendy style that would suit any girl. A style like this is perfect for spring and summer. Don’t be afraid of experimenting with different colors and styles. Our favorite go-to hairstyle is definitely a high bun, so we made sure that we have at least one bun style on our list. Braids and buns are so hot right now, especially if you combine them into one amazing updo. We love the chunky braid at the back of the head, and how the rest of the hair is shiny and sleek. There are plenty of tutorials on YouTube that can show you how to achieve this hairstyle. A style like this is for the trendsetters. 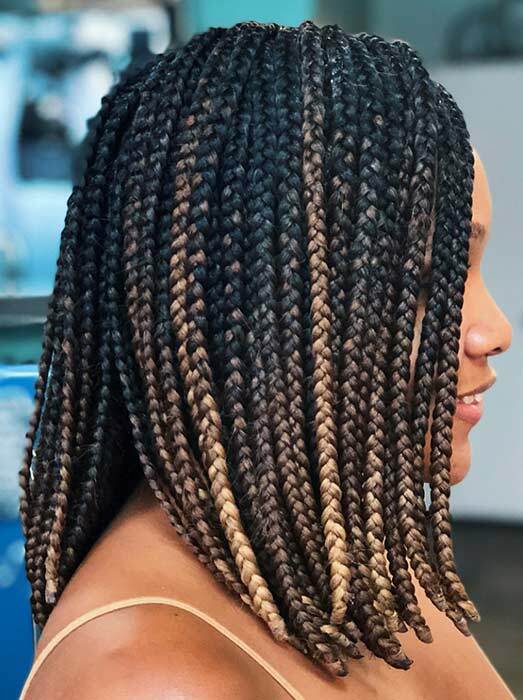 It features thick and thin braids with weave in funky design. We love this look and think you will too. This is a bold statement maker perfect if you like standing out from the crowd. 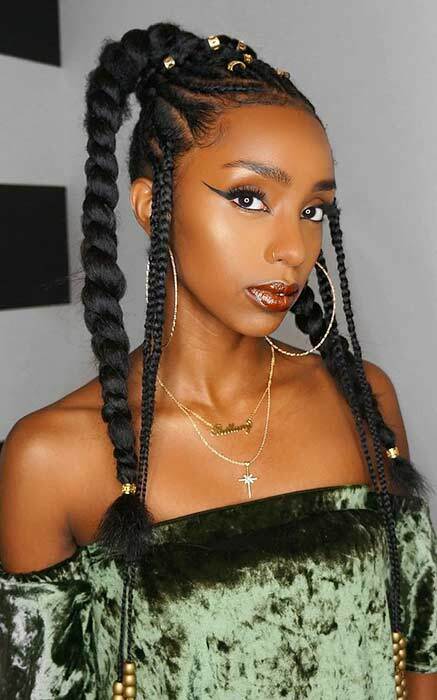 Protective styling shouldn’t be boring so make sure to jazz up your braids with gold hair cuffs. This look is actually pretty easy to do, just follow the steps from the tutorial below. Bob braids are easy to install and maintain. They won’t put as much pressure and pain on your head, but they will still look trendy and chic. 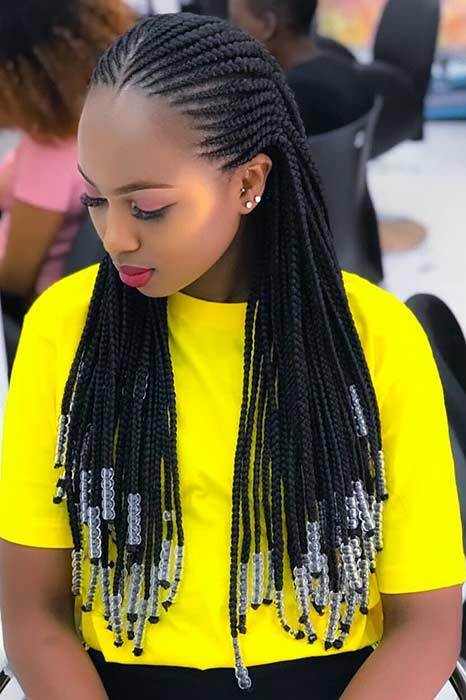 Also, this type of braids can be achieved in less time and for less money. You cannot go wrong with a bob braid style, that’s for sure. 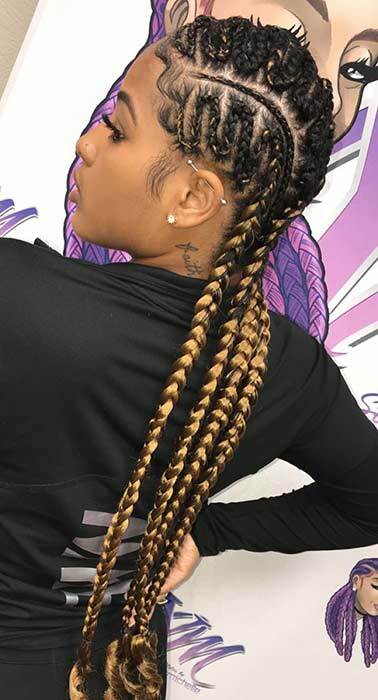 You can totally show off your braids while still keeping them out of your face. To achieve this high ponytail, you will need a small headband (or a big one that you can cut in half). You can cover the base of the ponytail with a few strands of braids or a colorful scarf. 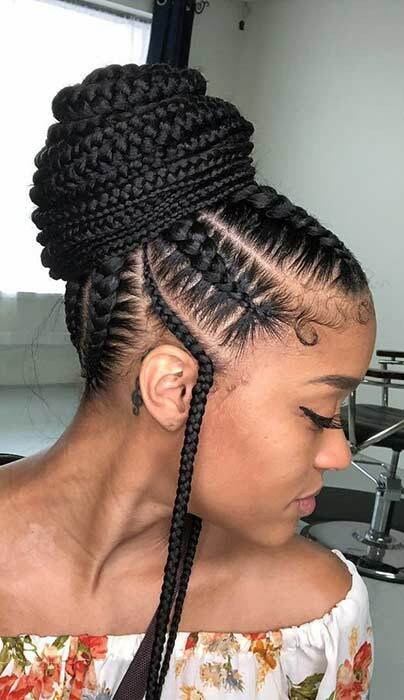 The next style on our list features awesome cornrows in a zigzag design. This is such a funky style that will be a unique touch to your look. It is a fun, bold and creative, which is what spring fashion is all about. A style like this will create a statement for any occasion. 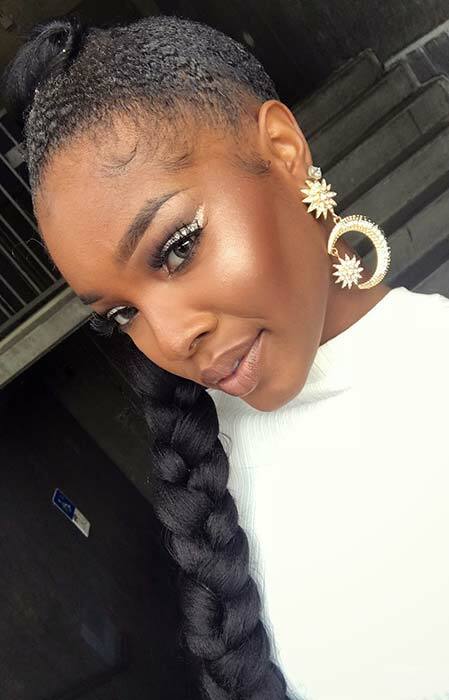 We love this caramel shade running through the braids, it makes the braids pop even more. 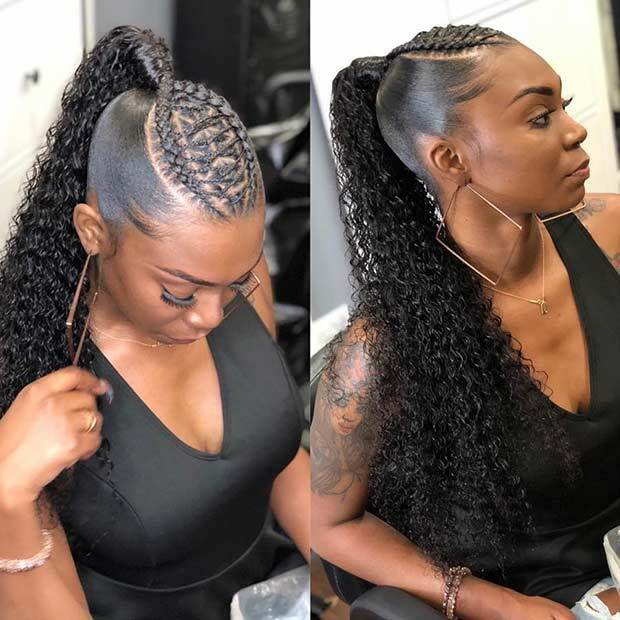 This is another way to wear a braided ponytail. Only this time there is a bold blonde running through it. Adding a shade like this gives your style an edge and makes it different. It’s cool and funky and will be a trendy hairstyle for any girl. Give your ponytail some oomph by opting for long curly weave and some small and big cornrows at the top. High ponytails are having a moment right now and we can see why. 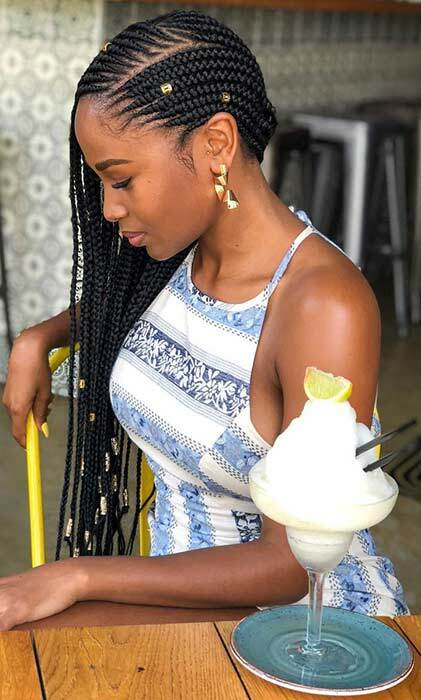 Lemonade braids are still trendy and loved by many. A style like this is for the girl that likes stealing the limelight. You will shine with a style like this! Looking for a bold new hairstyle? 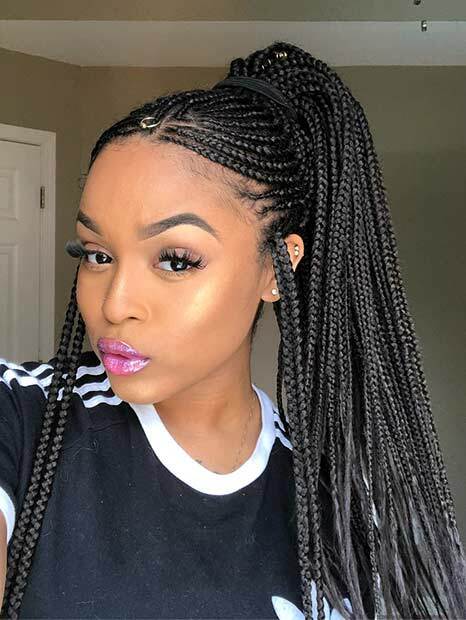 Our recommendation are big triangle box braids. When done right, big triangle braids look incredibly pretty. This butterfly braid hairstyle seems like it takes a lot of work, but actually it doesn’t. For the perfect finishing touch, accessorize your butterfly braids with cords in gold or silver color. Opt for this style for days when you want to feel super glam and elegant. The next hairstyle is a masterpiece! It is so intricate and features thick, feed in braids to the side. This is a special style that will wow everyone. Would be great for a night out or special occasion. It is a statement maker that will make some heads turn! Slay the high ponytail trend with this cute look. Here is a simpler braided style as it just features one braid with a ponytail. Even though it isn’t as intricate as some we have seen, that takes nothing away from the trendiness. This is a beautiful style that will suit everyone. 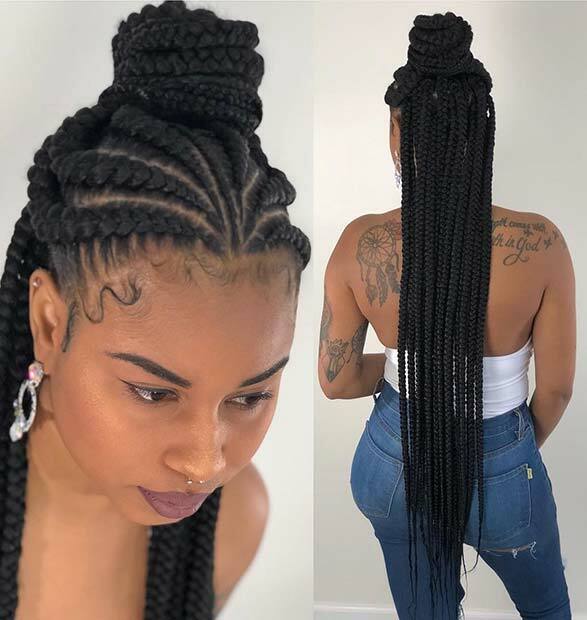 There are literally hundreds of ways you could wear braid hairstyles with weave, and tribal braids are one of them. 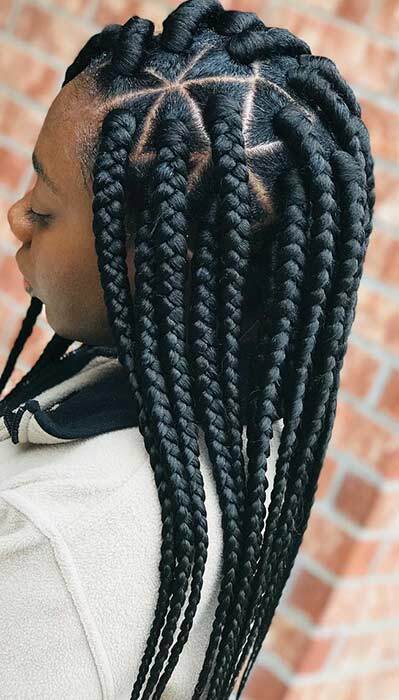 Tribal braids are this season’s hottest protective style. This hairstyle is ideal for spring and summer, especially if you adorn them with some cute beads. 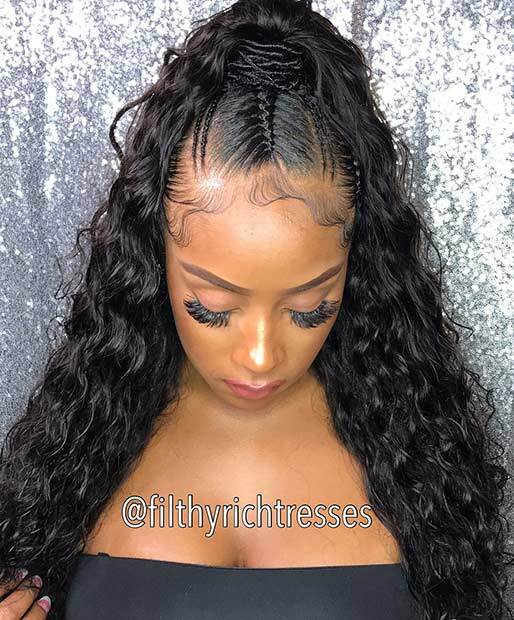 Here is another trendy way on how to wear braids with weave. Braid cuffs and cords are the easiest way to add a touch of color and glam to your look. We are crazy in love with this next style! Cornrows are an eye-catcher, especially when styled this way. This look will compliment any outfit, formal or casual. 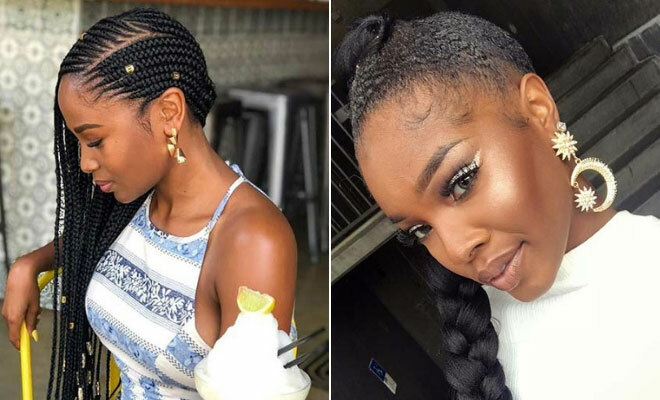 If you’re getting bored of the same old braid patterns, we encourage you to try these chunky braids to the side. These side braids will make the cutest summer style. 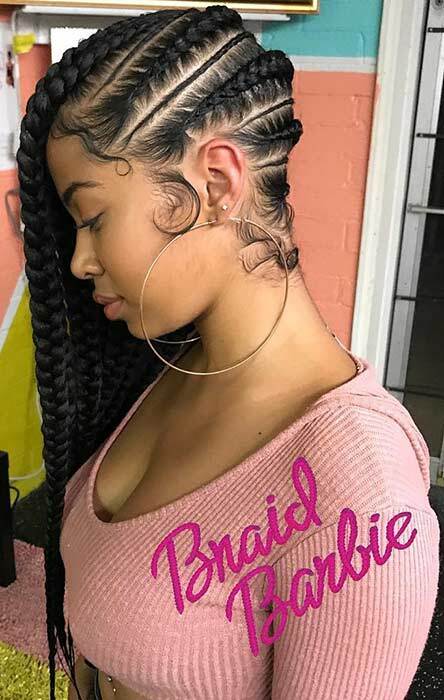 Braiding your hair into two cornrow braids always ends up with an amazing hairstyle, especially if you combine them with a long, curly weave. This style is cute, simple and elegant all at the same time. We hope you’ve find a style to try! We know we did. These styles are very elegant and beautiful. 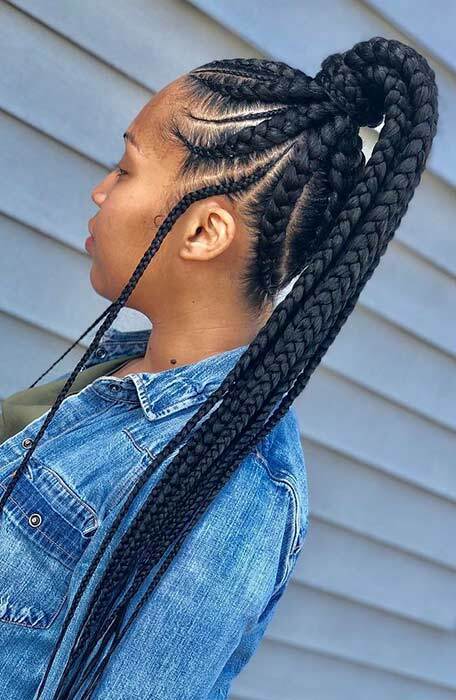 I love the styles of the braids and will get my hair style to try some of these styles.